Here are the top 10 top-end one-piece suits, as voted by 12,000 MCN readers in the MCN Biking Britain survey. 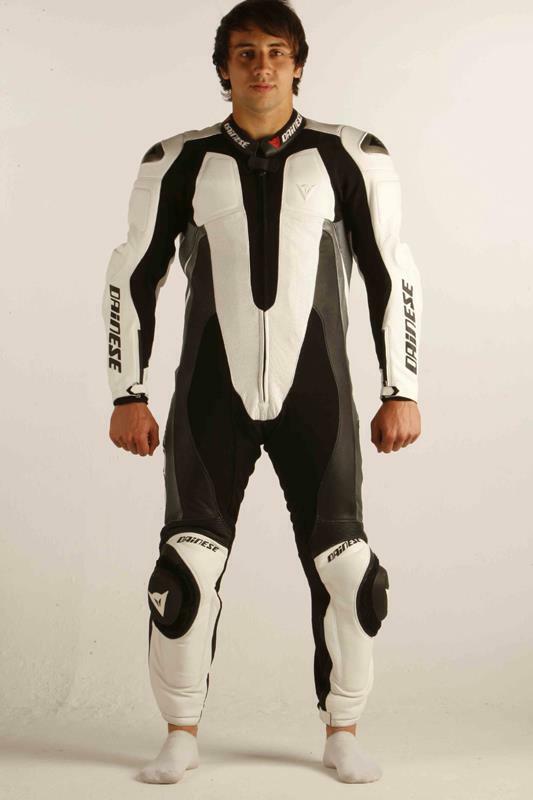 When released a couple of years ago, this was Dainese’s top specification race suit. The biggest feature difference to more traditional suits is the stretchy nylon chest panel that’s designed to keep a close fit to the rider without making it uncomfortable. It has CE armour throughout, a cowhide main construction, interchangeable sliders and a back hump. This is the suit of choice for Spidi’s sponsored racers including Colin Edwards, Marco Melandri, Leon Haslam and Cal Crutchlow. The kangaroo hide is 0.9 – 1mm thick and it’s heavily vented so weighs very little for a race suit. There are fabric stretch panels under the arms, crotch and behind the knees and stretch leather panels around the knees and lower back. There’s CE armour throughout that’s even adjustable in the knees and a race hump that can accommodate a water pack if required. Released late last year, this is the closest you can get to wearing the same suit as MotoGP legend, Loris Capirossi. Big news with this suit is the magnesium inserts on the shoulders and elbows that’ll stop the leather digging in and flipping you if you’re skating along the tarmac on your side. 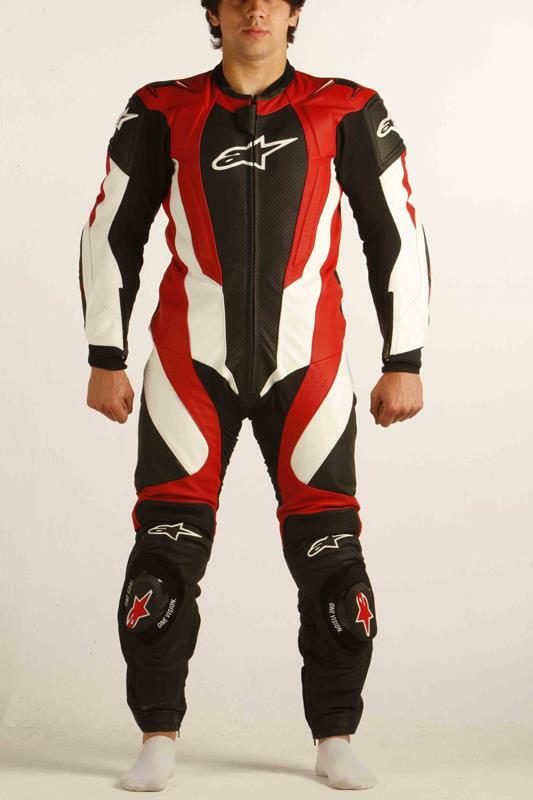 The suit has a main construction of cowhide leather, has race compound replaceable sliders and a removable inner liner. The RC-1 is made from a 1.2 – 1.4mm cowhide construction with plastic external shoulder armour and CE approved internal armour at the shoulders, elbows and knees. Designed to be one of the most comfortable one-piece suits, it has leather stretch panels at the upper back, rear waist and knees for better movement. The knee sliders are replaceable and the suit has a MotoGP-style back hump. The MX-1 has a multiple-stitched main seam construction to prevent the 1.2 – 1.4mm cowhide tearing at the joins in a crash. Alpinestars’ patented thermoplastic external shoulder protectors have been added to this suit to work along with the internal CE armour that’s at the shoulders also, as well as the knees and the elbows too, The back hump is a MotoGP style ventilated version, there are strategically placed stretch panels and you get a Bionic Race back protector as standard. The Xtreme is one of Hideout’s best selling suits. It has very minimal branding and you can custom choose the colourways to your own specific design. They’re heavyweight leathers made from top grade cowhide, and they also come in ladies sizes off the peg. Custom-fitted service is available, but at an extra £190. 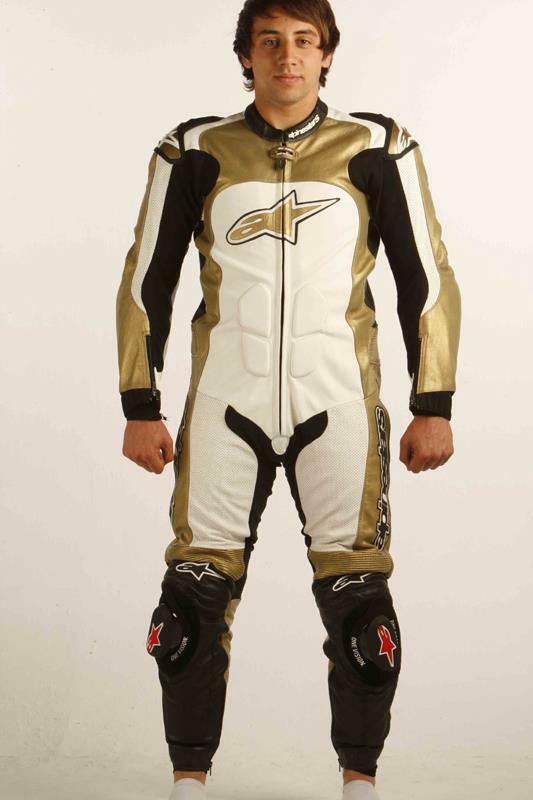 This is Alpinestars flagship, it’s MotoGP derived, top of the range racing suit. It’s like buying Casey Stoner’s very suit! It’s not the cheapest but it does have unique features like seamless elbows and arms to reduce tears in crashes, patented 45 degree leather flex zone across the back, exclusive plastic forearm and shoulder external protectors and a hard plastic knee and tibia protector. CE internal armour is included as well as a level two CE certified back protector. This suit is designed solely for those who don’t want loads of branding, larey colours and lots of flashy bits. The Classic is an old-school designed suit – simple yet premium grade cowhide construction with up to 1.6mm thick leather. They come with knee sliders and you can get them custom made to fit you perfectly. This was only new this year but already it’s made it into our top ten suits. The main construction is cowhide but with perforate front panels. There are titanium inserts on the elbow and shoulder and also on the knees. There’s an aerodynamic race hump, Kevlar stretch panels, CE internal armour and a removable inner lining. Sliders come as standard.